Since it opened its doors in 1875, The Palace Hotel, a Luxury Hotel, San Francisco has been an integral part of the city's history and evolution. Newly renovated, this iconic hotel features original architecture and authentic elements paired with classically inspired, modern décor for a look that’s rich, stylish and absolutely gorgeous. Guest rooms feature eleven-foot ceilings and expansive windows and capture the feel of a chic, private residence in beautiful downtown San Francisco. This hotel is just minutes away from the Embarcadero Ferry Building, Chinatown, Union Square, cable cars, San Francisco Museum of Modern Art and much more. 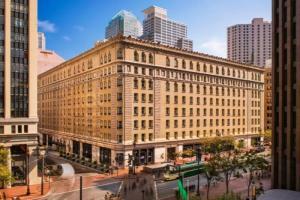 Located in downtown San Francisco, about 13 miles from San Francisco International Airport. Garden Court - Signature tea and city brunch, GC Lounge, Pied Piper - Casual dining and signature cocktails. Shopping, Ferry Building Marketplace, Golden Gate Bridge, Golden Gate Park, Museums, Alcatraz Island, Fisherman’s Wharf.